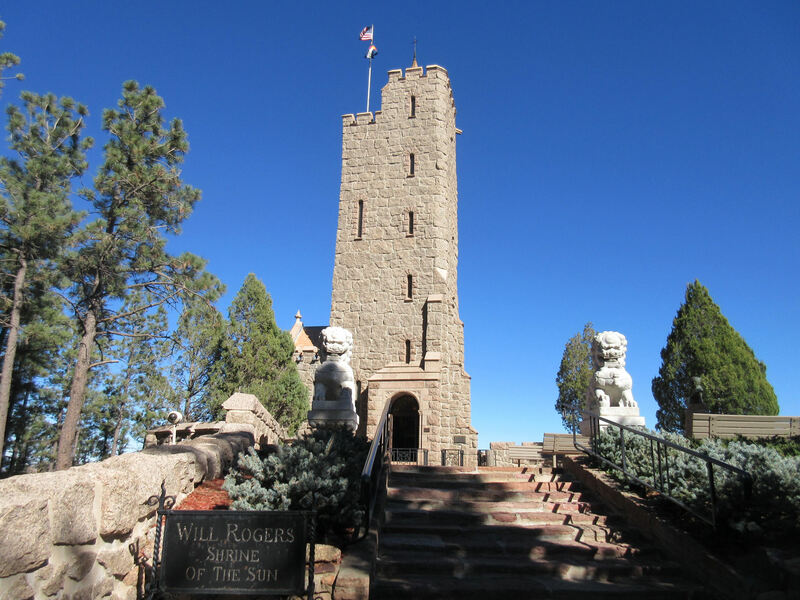 The Springs in Fall — 2015 Photos #13: The Will Rogers Fan Site « Midlife Crisis Crossover! If you visit the Cheyenne Mountain Zoo in Colorado Springs and read your brochure front-to-back, you’ll notice your admission includes an unusual mountainside bonus that requires some extra effort to check out. 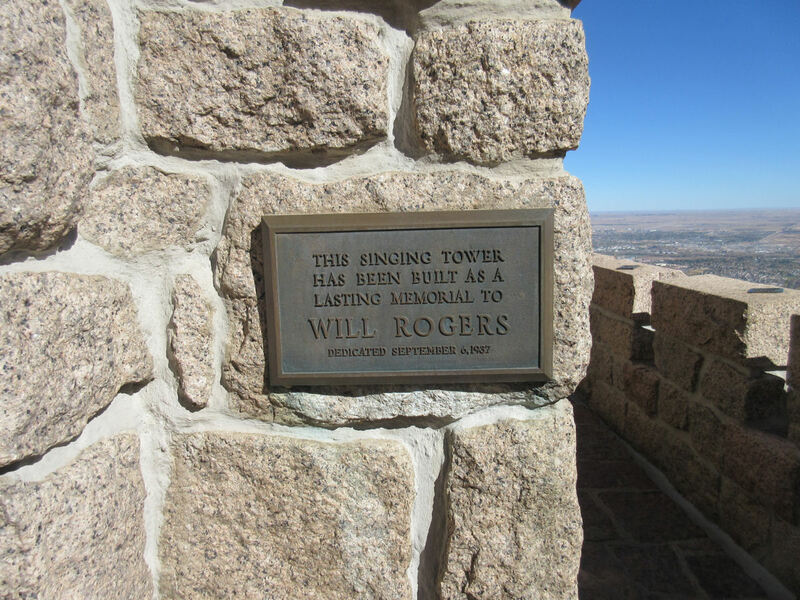 It’s nothing to do with animals, but it’s an interesting tangent in the Zoo’s historical and literal background even if you’re too young to know anything about actor/humorist Will Rogers. Ask your grandparents if they remember their parents ever mentioning him. If you’ve been following along with this series, you’ve technically already seen the Will Rogers Shrine of the Sun in two photos from Part 10. You just had to know where to look. Once you’ve enjoyed the heck out of the Zoo itself, ask someone at the admission booths about the Shrine. 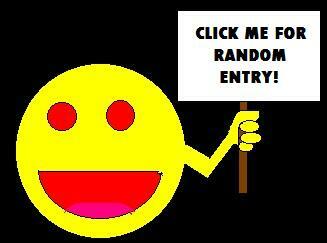 They’ll usher you and your car through a metal gate off to the side. You have to drive a maximum of 5 mph on an uphill road that cuts through the middle of the zoo itself, taking maximum care to stay slow and not bump any giddy kids along the way. 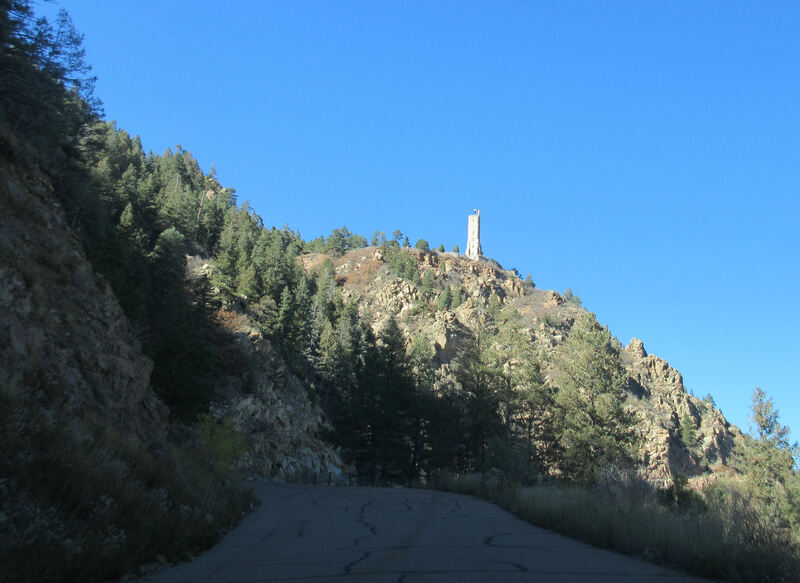 After a year of inching and inching and inching and inching and inching, eventually the road exits through the back of the zoo, bumps up the speed limit to 20 mph, then snakes another 1.4 miles up the side of Cheyenne Mountain till you reach the Shrine’s parking lot. 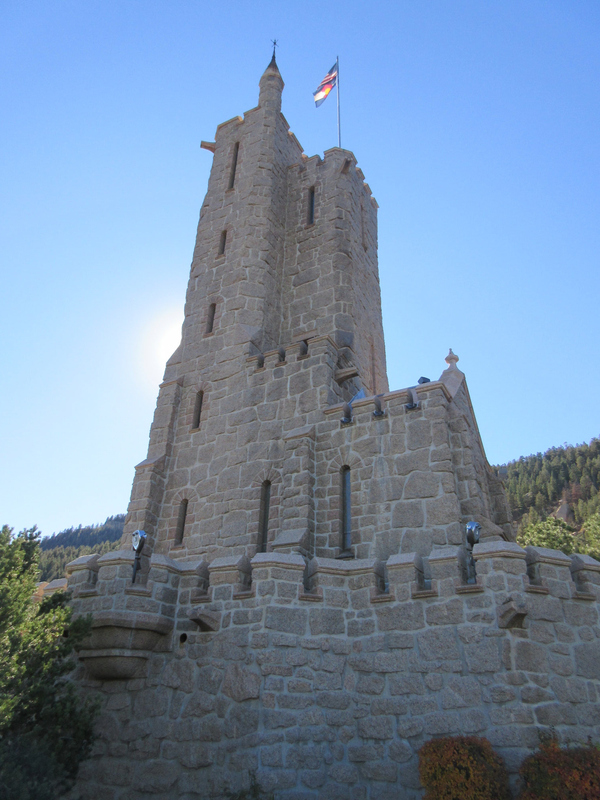 Sitting 1500 feet above Colorado Springs and 8100 feet above sea level, the Shrine was the brainchild of Spencer Penrose, an extremely well-to-do philanthropist and venture capitalist with dollars and interests in numerous local companies and organizations all over town, including the Zoo itself. 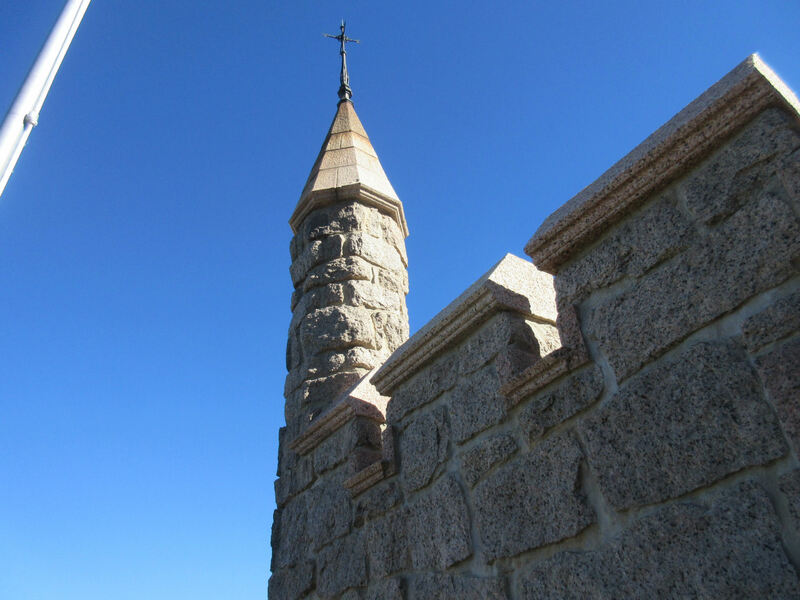 Built from 1934 to 1937, the Shrine was intended as his mausoleum. 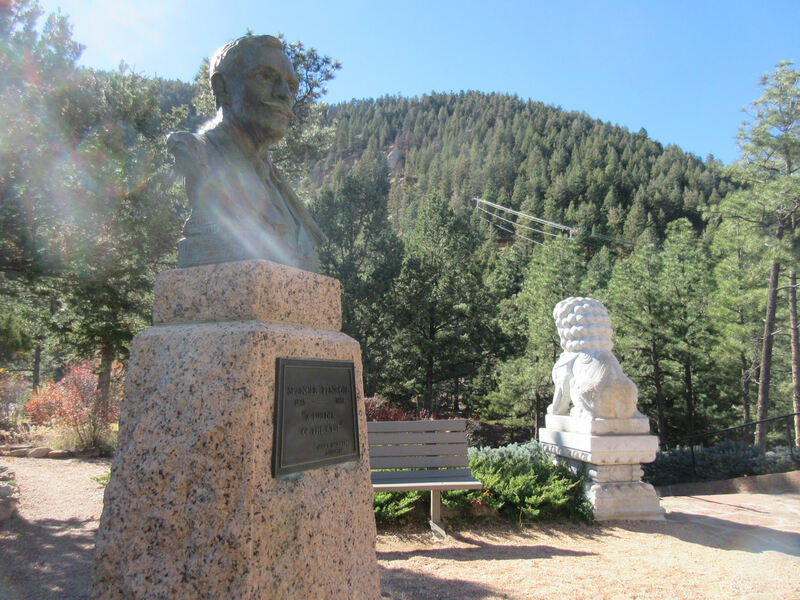 Will Rogers was born in Oklahoma and never lived in Colorado, but he struck up a friendship at one point with Penrose during a stay at the Broadmoor Hotel, another of Penrose’s well-known institutions. I’m guessing it’s a pretty nice place. 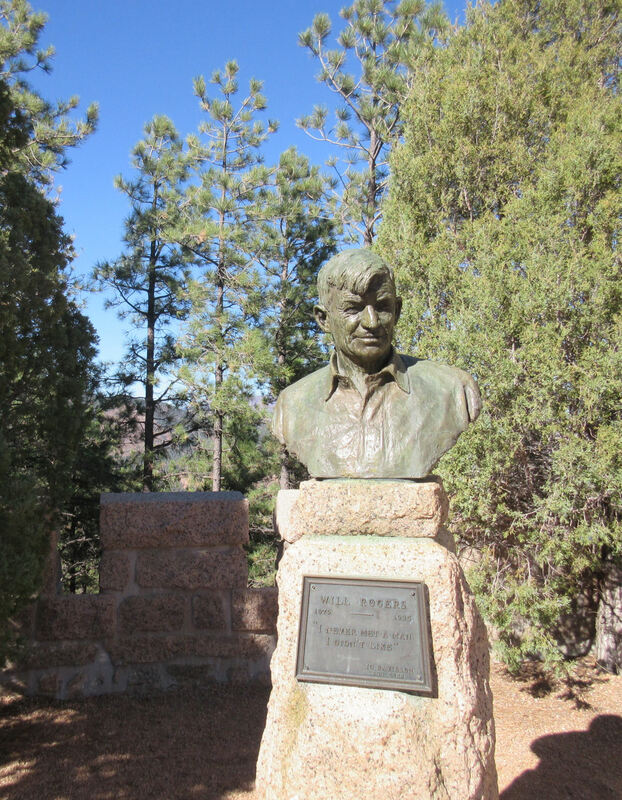 When Rogers died in a plane crash in Alaska in 1935, Penrose decided to have the Shrine dedicated to Rogers instead. With some work it turned into a sort of Will Rogers museum. Call it the ultimate tribute by Will Rogers’ #1 fan. Penrose passed away in 1939, two years after the Shrine’s completion. The lower level inside the Shrine is a chapel that also serves as his official mausoleum, as well as his wife Julie’s, whose name we last saw in connection to a previously covered tribute to her. The room is decorated with an assortment of antique art dating back to the 15th and 16th centuries. 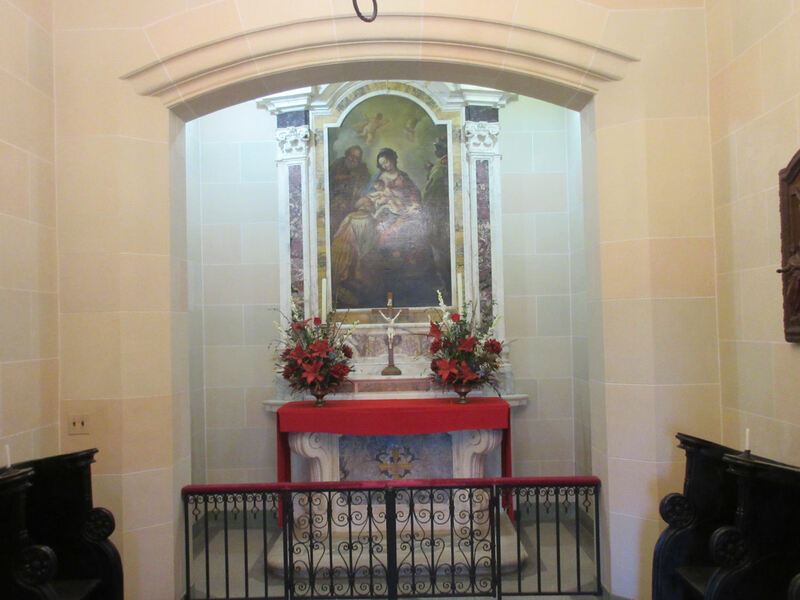 The chapel is off limits to visitors; this pic was shot through iron bars. Five stories of metal staircases climb up through a series of rooms in the tower. 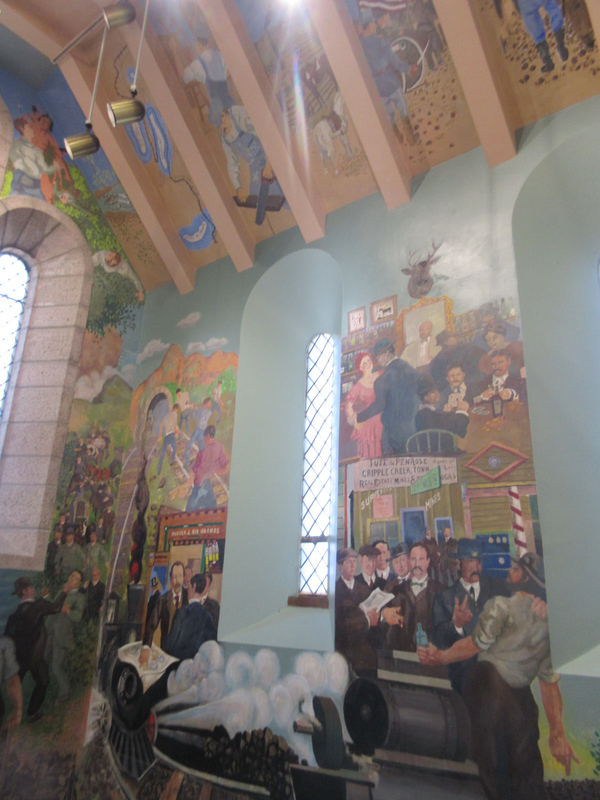 Murals decorate the lower floors, depicting personalities and businesses native to the area. 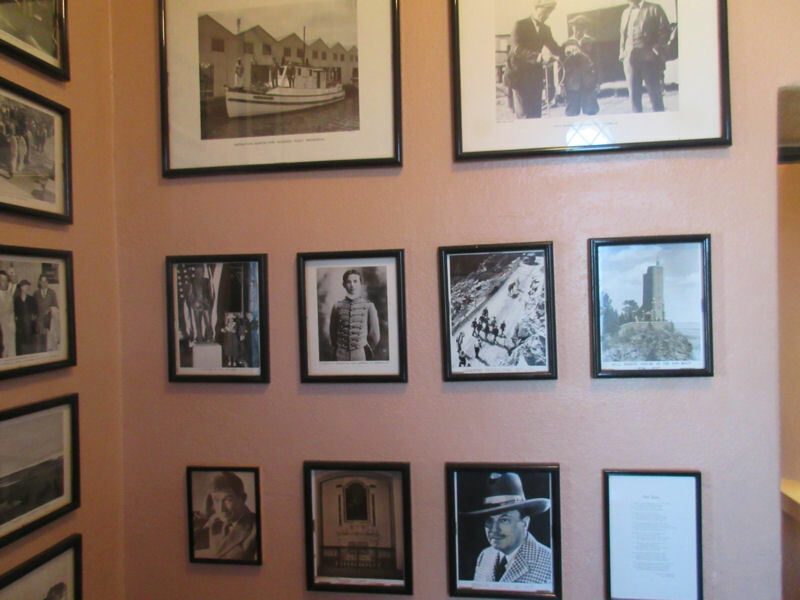 Further up the spiral are photo galleries commemorating the lives of Rogers and the Penroses. The higher you climb, the more you get to see. Thankfully I brought plenty of water and was prepared for the higher elevations and the extra exercise. I made it all the way to the highest allowable balcony without collapsing. As my reward, I got a closer look at the very top of the Shrine. 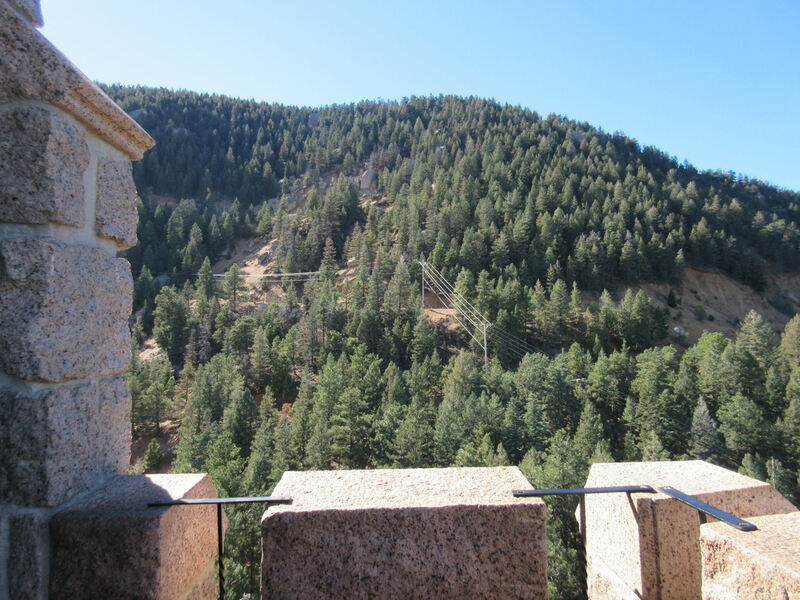 To one side, I could see Cheyenne Mountain in greater detail and notice signs of civilization continuing upward beyond the Shrine. That zoo admission didn’t confer all-access privileges to the entire mountain. 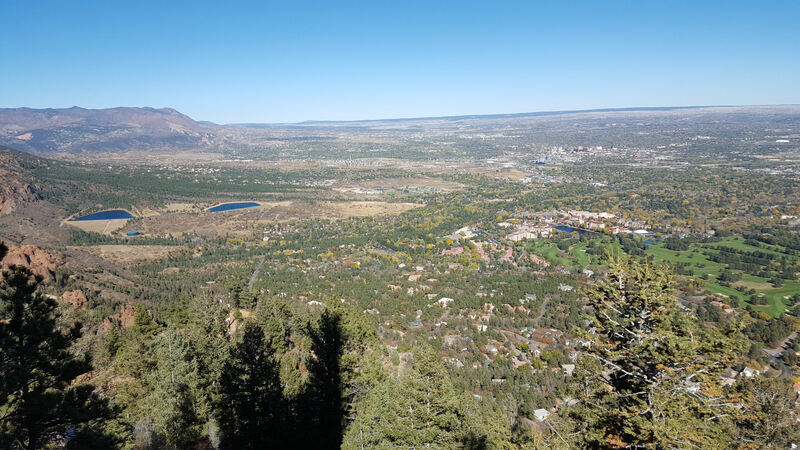 Acrophobes might not appreciate the vast view of the city of Colorado Springs, but the option to gaze upon it in awe is yours to take. You just might recognize parts of downtown. Squint closely enough and you can tell which tan dot is the Garden of the Gods. If you’d prefer assistance and brought quarters, there’s a handy tower viewer for your binocular pleasure. A lower-level deck afford the best view of the Shrine from the front. From here I could best hear the chimes that play every hour on the hour, and at what felt like epic length for the 12 noon performance. Once I’d seen enough, and once I realized I was starving, I retraced the slow series of hairpin turns down the mountain, crept once more at turtle speed through the middle of the Zoo, ventured back into the surrounding forested neighborhoods, got lost once, and then descended toward the lower elevations of downtown, relieved to drive normal speeds once more.